"Every gift involves a sacrifice. If not, what kind of gift would it be?" Why are films that deal seriously with the idea of spirituality so inscrutable? I suppose this is an exaggeration, they aren't all difficult to get to the bottom of. Any art made with the express intention of, say, pushing a religious message is usually far more basic than the topic demands. It's the films that dive headlong into the unknowable abyss that often leave me coming up short upon first viewing. It's not that I don't trust that the filmmakers have put all the possible answers onto their flickering canvas, it's that their questions breed more questions, and the whole point is there is no definitive explanation for any of it. To follow them as they seek knowledge through fiction is to take a leap of faith that there is something on the other side, even if once we've sat through the closing credits, we may have only come up with a bunch of new mysteries to ponder. In most recent memory, it was Terrence Malick's The Tree of Life that left me feeling this way. What exactly that movie meant, or even how well it tied together, was immaterial to the experience of being a part of the expedition. So, too, is Andrei Tarkovsky's final masterpiece, The Sacrifice, a puzzling, enervating journey toward a deeper understanding of man's place in a baffling universe. That both motion pictures borrow heavily from the Book of Job and use relationships between a father and son to sift through mankind's cosmic baggage is probably less a coincidence and more of an indicator of the state of the human condition. No matter what we may believe as individuals, existence is an ongoing struggle to maintain one's personal momentum when it seems so much easier to surrender to our common mortality. The plot of The Sacrifice is surprisingly simple to describe. It takes place over the course of a day or two as one Swedish family deals with the fact that nuclear war is imminent. The head of the family is Alexander (Erland Josephson, Saraband). He is an old man with a younger wife (Susan Fleetwood) and two children, a grown-up daughter named Marta (Filippa Franzén) and a very young son that everyone calls "Little Man" (Tommy Kjellqvist). Alexander dotes on the boy, hoping to imbue in him a sense of spiritual purpose in a world that has lost its way. Alexander regularly voices a concern over the difference between words and deeds. How we express ourselves and, indeed, the very meaning of expression and what it means for individual identity is very important to him. At one time, he was a respected stage actor, but he gave up the vocation because he believed it was false. To pretend to be something you are not goes against nature. The Sacrifice opens on Alexander's birthday, prior to the announcement of World War III. Alexander and Little Man are planting a tree, a physical symbol of their intention to make the world a better place. On this excursion, they happen on Otto (Allan Edwall), the mailman, who likes to quote Nietzsche and debate philosophy with Alexander. Both he and the birthday boy will be struck with visions at different times in the movie, just two of the unexplained and possibly supernatural events that permeate the picture. In the evening, Otto attends Alexander's birthday party, presenting him with a gift of an ancient map, another symbol of how man's knowledge is inconstant; it is subject to what he thinks he knows at any given time. Also at the gathering is Alexander's son-in-law Victor (Sven Wollter), their live-in maid Julia (Valérie Mairesse), and an Icelandic woman named Maria (Gudún S. Gísladóttir) who also works in the house. Maria represents a sense of other, an outsider whose ways are not familiar to her employers, particularly the harsh mistress of the home. Likewise, Otto is new to the area, and so he too differs in thinking from Alexander's brood. Once the news of impending doom reaches the family, The Sacrifice goes haywire. Colors change, growing increasingly washed out, as if nuclear winter is already setting in. The son-in-law, a doctor, immediately gives the women sedatives while the men turn to drink. Alexander has more visions, and in a powerful scene, appeals directly to the heavens to barter for man's survival. Tarkovsky shoots it from above, asking Josephson to perform it by looking into the camera, his eyes full of tears, and essentially begging the audience as if its role is to be the supreme force in any cinematic universe and can move the burden from his shoulders. This, of course, is not in our power to grant, it's up to the filmmaker, and Tarkovsky, using Otto as his vessel, presents Alexander with another solution. What if Maria were really a witch, and laying with her could avert this crisis? The culmination of this mad scheme is one of the most beautiful things I have seen on film, and the technical wizardry that Tarkovsky employs to pull it off is amazing. Whatever special effects he uses, they are imperceptible: the Russian director truly creates magic. The Sacrifice was made in 1985 and released in 1986, when nuclear war was still a very real and scary thing for most of us. At the time, Tarkovsky was dying of cancer, and so how the father here counsels his son and fights to keep him alive has added meaning, especially once we see the final title card informing us that Tarkovsky dedicated The Sacrifice to his own son. This is a piece of art where the artist is quite literally grappling with his own mortality (is the father God? Is the son?! ), and one that even uses art as an indicator of how man knows his own soul and passes that knowledge on to others. Alexander gazes longingly at classic paintings, pondering the impulse that drove the creator to put brush to canvas. In his view, the artist is akin to a monk. Ritual and repetition means dedication, and regular action changes the course of life as we know it. Tarkovsky draws a lot into The Sacrifice and keeps no impulse at bay. Yet, it never feels like he's trying to empty his bucket list or lacks control of his medium. The movie never seems anything but absolutely assured, moving at its own pace and cagily drawing the viewer through each scene and into the next. It may be a little slow-going at first, but give it your attention and The Sacrifice will envelope you. It's demanding, yes, but Tarkovksy never asks for more than he can actually pay back, and for those who really get into it, he pays you back with interest. The widescreen, 1.66:1 transfer of The Sacrifice is absolutely lovely. The 1080p image displays a remarkable depth of field, with elaborate details and realistic textures. The production team deals with the shifting image styles beautifully, adjusting the tones in order to best represent Nykvist's intentions. There is a pronounced difference between the bright and colorful daylight scenes that bookend the film and the bleak nightmares that besiege Alexander as death approaches. There were hardly any instances of scratches or marks on the film, and only twice did I notice any splotchy backgrounds--and those were in odd scenes, they may just be a product of the onscreen metamorphoses. Same goes for some slight edge enhancement, which isn't readily noticeable most of the time. Really, this is an impressive disc, worthy of any praise heaped on it. The original Swedish soundtrack is given a two-channel mono mix that is surprisingly warm and conscientious of the aural space available. There is very good use of ambient noise and volume levels to create a realistic sounding landscape even within the limited speaker range. The few scenes where the sound effects grow loud have the appropriate heft, making it seem that the screening room is shaking as much as the room inside your television. Kino only gives us one extra on The Sacrifice, but it's a big one, certainly nothing to be sneezed at. The Blu-Ray comes with a second disc, a standard-definition DVD of the complete 99-minute documentary Directed by Andrei Tarkovsky. 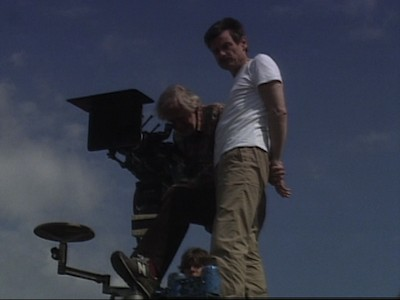 Compiled in 1988 by Michal Leszczylowski, it is, essentially, an on-set documentary made from footage shot during the production of The Sacrifice, showing Tarkovsky at work building his motion picture, including instructing actors, nitpicking the sets, and even cutting up a little. The raw material is intercut with the corresponding scenes from The Sacrifice, giving an idea of how his vision went from the abstract to the actual. 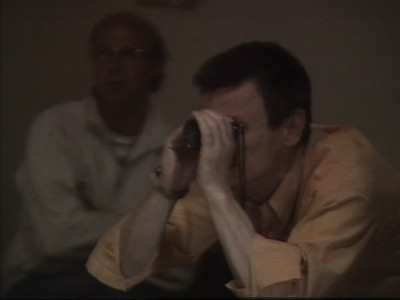 Leszczylowski also takes detours into footage from lectures and personal appearances, and he layers excerpts from Tarkovsky's book Sculpting in Time over the top. Erland Josephson reads the prose, tying everything together nicely. Directed by Andrei Tarkovsky is a deftly executed simulacrum of the Tarkovsky method, applying the director's own creative philosophy to a motion picture about his creative process. Andrei Tarkovsky's final film is a powerful and affecting engagement with the very notion of mortality and man's place in a universe that seems too large to contain him. Erland Josephson stars in The Sacrifice as a father trying to find meaning and a spiritual haven for his family in the face of imminent nuclear war. Dreamlike and oft nightmarish, ponderous and provoking, The Sacrifice is a special film, making flesh out of philosophy and challenging the audience to step further into the abyss, accepting on faith that there will be something there. The Kino Blu-Ray presentation is excellent, complete with a bonus DVD with a full-length documentary. Highly Recommended.